XCOM 2 is easily my favourite game of the year so far. It also has serious performance issues. It’s been two weeks since the game launched, and unfortunately, the latest update does little to alleviate them. The update was intended to fix crashing problems and “some” performance issues. In the former area, at least, it seems like a pretty big success, stomping the dreaded Chryssalid Cocoon save bug into eggy paste. 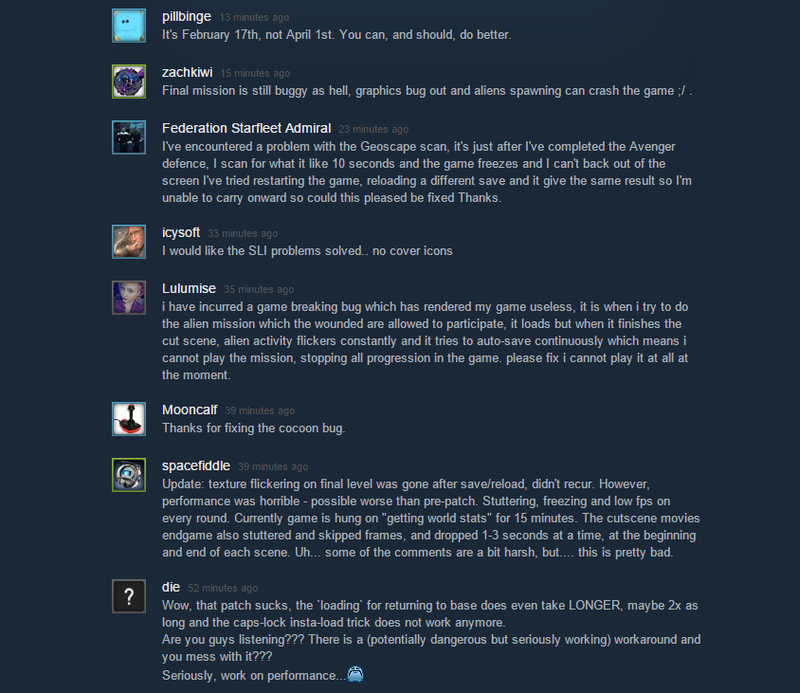 An early game progress-halting bug involving communications research is also out, as is a bug that would cause the game to crash if you tried to preview a modded voice pack. If your saves were affected by any of these bugs, they should be usable again. However, if you’ve been suffering from sand-paper un-smooth frame rates and things of that nature, bad news: very little has changed. According to the patch notes, “adjustments were made to Texture Streaming to assist with periodic frame spikes”. In my experience, though, XCOM 2's frame rate is still awfully inconsistent, often shedding ten frames or more like a Faceless dropping the whole “human” act. My overall frame rate, meanwhile, has leaped up by around three or four frames, but that’s not particularly significant in the grand scheme of things. I’m still getting 30 FPS or less most of the time, even though I’m running it on a rig that exceeds recommended spec. It’s especially weird given that the pre-release code I received for my review performed significantly better, usually managing around 50-60 FPS. Oh, and of course, the load times are still frustratingly lengthy. But hey, at least we’ll always have caps-lock. Fortunately, XCOM 2 developer Firaxis says they’re only just getting started.